The world's largest second-generation VLOC (Very Large Ore Carrier), a 400-thousand-ton ore carrier built by Shanghai Waigaoqiao Shipbuilding, was delivered to China Ore Shipping in Shanghai on Thursday. The ship is the first of its kind to roll off the assembly line. The ship was named 'Yuanhehai', which means 'distant rivers and seas', in the naming ceremony that took place when the ship was delivered. At 362 meters long, 65 meters wide, and with a depth of 30 meters, the single-propeller diesel engine ship can navigate in a wide range of conditions and at low speed. Featuring economical, environmentally friendly, energy efficient, and safe technology, the ship is one of the most advanced ore carriers in service around the world. The ship's fuel consumption per nautical mile travelled is nearly 30 percent less than first generation VLOCs. Shanghai Waigaoqiao Shipbuilding entered a contract with China Ore shipping in March 2016 to build 10 400-thousand-ton VLOCs. The 'Yuanhehai' is the first ship to be delivered. The ship manufacturer also signed a 4-VLOC deal with China Merchants Group, which brings the company to a total of 14 deals for VLOCs, making it the world's largest manufacturer of this type of vessel. The ship set sail on December 14 last year on a successful 7-day voyage. China Ore Shipping is a subsidiary of China Cosco Shipping Group, which has 1,114 vessels with a total capacity of 85 million tonnes, making it the world's largest carrier. 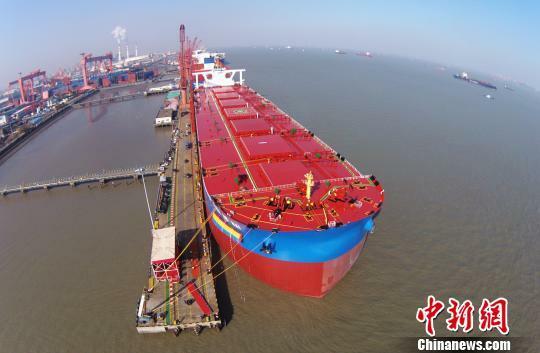 The world's largest second-generation VLOC (Very Large Ore Carrier), a 400-thousand-ton ore carrier built by Shanghai Waigaoqiao Shipbuilding, was delivered to China Ore Shipping in Shanghai on Thursday.